World record in Olympic press lift by Adam Gnatov stays unbeaten. 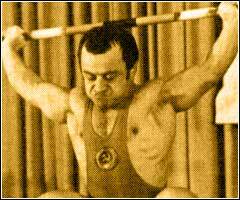 In the early 1970s, Adam Gnatov knew no equals to himself in Olympic press in the 52 kg class. The record set by a 132-cm tall athlete was set at 120.5 KG in 1972 and remains unbeaten today. Nowadays, Gnatov coaches in a specialized youth sports school # 1 in Lvov, Ukraine. He is married and raises a daughter Natalia and son Adam. In 1972, you were one of the best in the World. How come you didn't compete at the 1972 Olympics? They tried to bend me over because of the politics. I won the Olympic week in Germany which was the general rehearsal prior to the Olympics. There were representatives of all countries. They said Gnatov is an Olympian now and gave me a golden badge with Olympic logo on it. Then suddenly one big paper wrote that Gnatov is in the hospital. I was in a perfect shape. Prior to that I set two world records at the Baltika Cup. I also had the world record in the total of three lifts. However, the national team management decided not to bring anyone in the 52 kg class. Did you have any chances to win a gold medal in Munich? I think so. Polish athlete Zygmunt Smalcerz won with the 337.5KG total and my best total was 342.5KG. I couldn't guarantee you the gold medal but I had no doubts about winning a medal. They dumped me with the Olympics in 1972. They simply wasted the Olympics. Four Soviet athletes bombed out and no Soviet athlete competed in the 52 kg class. In 1972 you won silver medal at the European Championship and lost to Smalcerz. What was the reason for that? There was a factor of over competing at the time - I had to compete at the Friendship Cup, at the national championship and right after that at the Europeans. They simply exhausted us. As for losing to Smalcerz, they used anabolics alot in Polish team. Didn't Soviet athletes also used doping? Sure. But not as mucxh as Polish guys. Serious testing for doping began only after 1982. In 1976 you had a chance to compete at the Olympics in Montreal. Yes. In order to do that, I had to win one of the top 2 places at the USSR Spartakiad in Vilnius. I finished on the 4th place. Why? Coaches of Ukrainian team set training camp not for athletes but for themselves. It was in Feodosia. We swam in the Black Sea, ate caviar. There was an extreme heat - nearly 100 degrees in the shadow. And the Spartakiad was to take place in Vilnius in the north. We got flu right away over there. Vasily Alekseev was the captain of the national team. What was your impression on him? All best supers were rude and rough. They had voices of mutants. How much were you paid for the records? 750 roubles. After taxes, it came down to 600 rubles. I know you had a heart attack. Yes, it was in 1987. The doctors told my wife I got a couple of days left to live. Maybe, couple of weeks. After that I won the Europeans in 1995 among veterans. Trying to get the ends meet. My pension is minimal. I am being paid a little more due to my special merits to the state of Ukraine - so, it is bare minimum plus 35 percent or about 800 grivna. Local representative in 1995 said that Adam got to wait. It's easier for him to say.